Main frame is 69” square x 240” tall, modular carbon steel 4” square x •••” wall structural tube with continuous welds. Unit designed for Class II, Division II, Group G location service. 2-ton electric chain hoist with motorized trolley and nylon energy chain package. 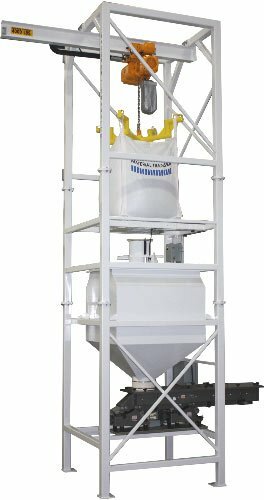 Custom ultra-low profile Mantis™ style bulk bag lifting frame for increased bulk bag clearance during loading. Carbon steel bulk bag support pan for enhanced bag stability and operator safety. Sure-Seal™ pneumatic spout clamping system seals bag spout for dust-tight discharge. Free-standing product discharge transition for easy bag spout connection. Unit features an operator access platform for bag connection (not shown). 50 cu.ft. capacity carbon steel surge hopper with supports. Dual drive vibratory feeding system with variable speed controls and integral screener. Carbon steel sandblasted, and painted FDA Dairy white using a two-part epoxy system.